Step 4: Share a link to the map you have created, or download the dataset you have filtered. On the left side of the visualization tool is a series of expandable menus. You can use these tools to manipulate the data. Filter Menu Set date ranges, or search for data by a number of other variables such as partner group or species. Boundary Layers Menu Overlay regional borders on the map, and select data geographically. 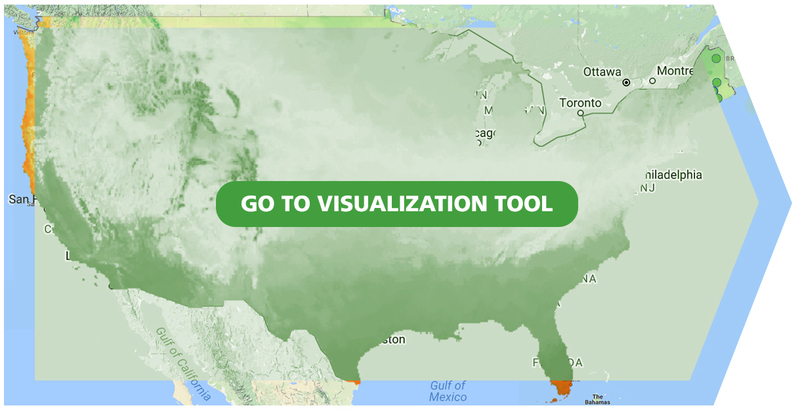 Visualization Menu Load filtered data into various visualizations. See below for more details. Settings Menu Control application settings such as how to display sites, and whether or not to include less precise data for some visualizations. 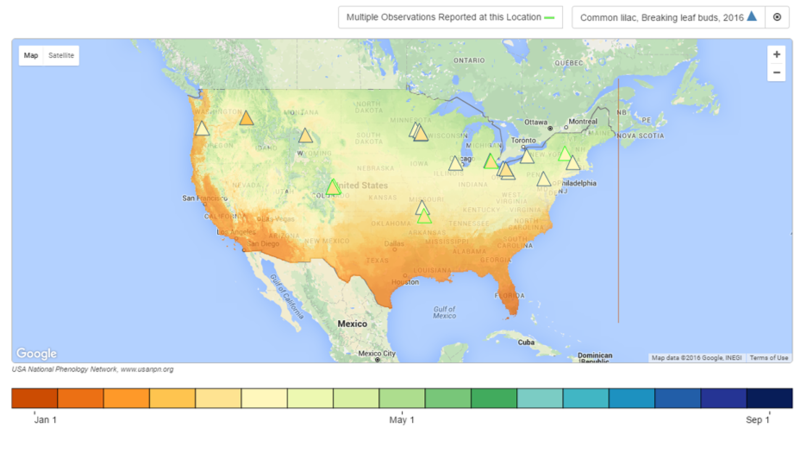 View all sites registered with Nature's Notebook. Depending on the settings you choose, the number of phenophase status records or the number of sites will be displayed. 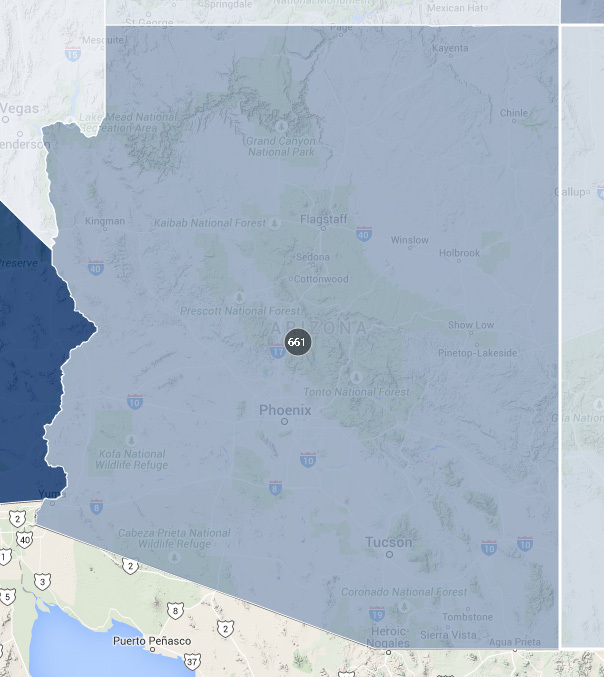 When opening the tool, you will see an overlay of the United States, each with a marker in the center of the state. This number indicates the number of sites at which observations have been made. The tool will group observation sites by geographic area. 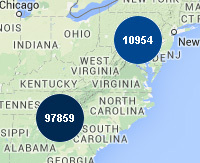 If you apply a filter to the map and click on a state to expand the view of its locations, you can see the data "clustered" as in the picture at left. The number in the circle is the number of status records in that area. In the Settings Menu, you can choose to instead show the number of sites or to turn off clustering altogether. Zooming into the map far enough will show individual sites (circled in red in the picture at left). Clicking on a site provides some additional details about that site. The intensity of color (light to dark) of the marker indicates the density of the data at that site. Mousing over the locaton also shows a scale indicating the relative density of the data compared to other sites displayed on the map. Once you have filtered the data by years, species and areas of interest, you can visualize the data in multiple ways. This visualization plots selected geographic or climactic variables against estimated onset dates for individuals for up to three species/phenophase combinations. 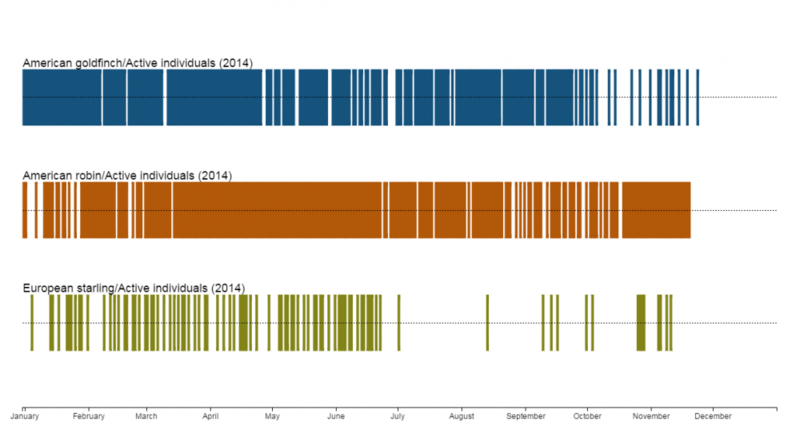 This visualization illustrates annual timing of phenophase activity for selected species/phenophase combinations. 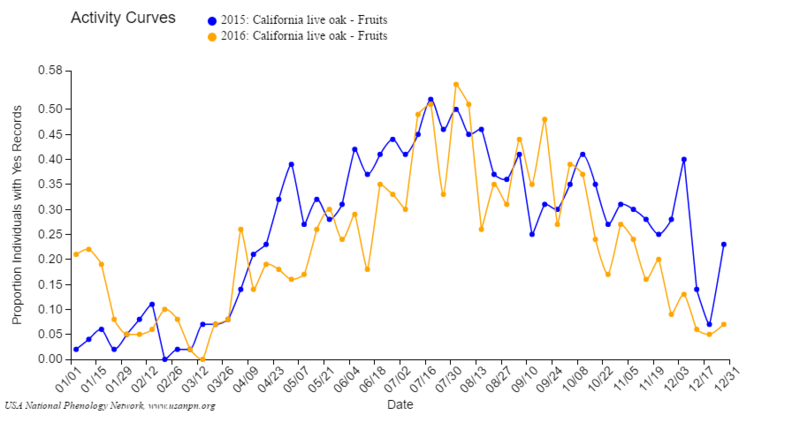 Horizontal bars represent phenological activity for up to two years for selected sites. The colored bars represent observed presence of the phenophase. If you choose to display negative data, gray bars represent the observed absence of the phenophase. 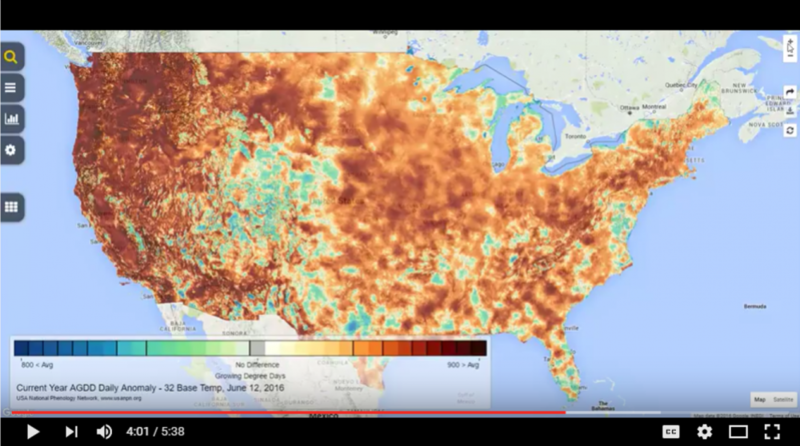 This visualization plots annual patterns of the timing and magnitude of phenological activity, based on proportion of “yes” records, animal abundances per hour and other metrics. Data are summarized at a weekly, biweekly or monthly scale for one or more sites, for up to two species, phenophases, or years. 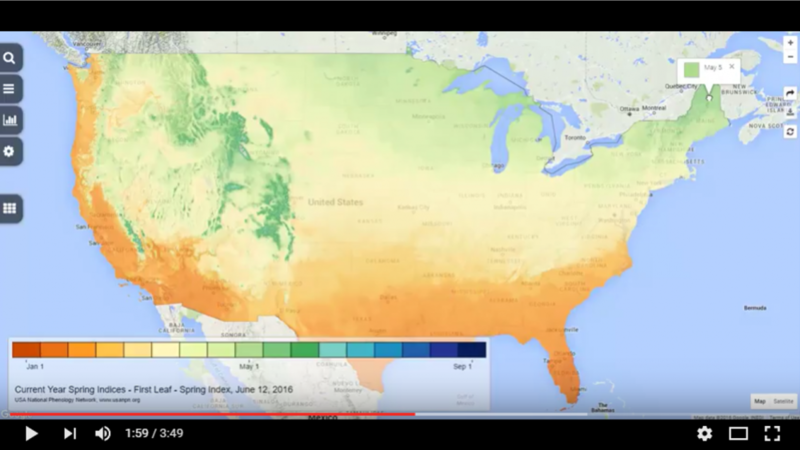 This visualization maps ground-based observations against USA-NPN phenology maps, including Accumulated Growing Degree Days and Spring Index models. Onset DOY: The first day of year (a calendar date between 1 and 366) that the phenophase was observed as occurring on an individual at a site. Precipitation and temperature data (described below) are derived from Daymet. Thornton, P.E., M.M. Thornton, B.W. Mayer, Y. Wei, R. Devarakonda, R.S. Vose, and R.B. Cook. 2016. Daymet: Daily Surface Weather Data on a 1-km Grid for North America, Version 3. ORNL DAAC, Oak Ridge, Tennessee, USA. Data set. Available on-line [http://daac.ornl.gov] from Oak Ridge National Laboratory Distributed Active Archive Center, Oak Ridge, Tennessee, USA. Date accessed: 2015/06/01-Present. Temporal range: 2008/01/01-present. Spatial range: N=52.00, S=14.53.DD, E=52.95, W=131.10. http://dx.doi.org/10.3334/ORNLDAAC/1328. Latitude: The latitude of the site at which the target individual and phenophase was observed. Longitude: The longitude of the site at which the target individual and phenophase was observed. Elevation (m): The elevation of the site at which the target individual and phenophase was observed. Year: Year of the Onset DOY. Precip Fall (mm): Accumulated precipitation for the previous year's fall season, relative to the year of the Onset DOY (September-November). Precip Spring (mm): Accumulated precipitation for the year of Onset DOY spring season (March-May). Precip Spring (mm): Accumulated precipitation for the year of Onset DOY summer season (June-August). Precip Winter (mm): Accumulated precipitation for year of Onset DOY winter season (December of previous year-February of onset DOY year). Tmax Fall (oC): Average maximum temperature for the previous year's fall season, relative to the year of the onset DOY (September-November). Tmax Spring (oC): Average maximum temperature for the year of Onset DOY spring season (March-May). Tmax Summer (oC): Average maximum temperature for the year of onset DOY summer season (June-August). Tmax Winter (oC): Average maximum temperature for the year of Onset DOY winter season (December of previous year-February of onset DOY year). Tmin Fall (oC): Average minimum temperature for the previous year's fall season, relative to the year of the Onset DOY (September-November). Tmin Spring (oC): Average minimum temperature for the year of Onset DOY spring season (March-May). Tmin Summer (oC): Average minimum temperature for the year of Onset DOY summer season (June-August). Tmin Winter (oC): Average minimum temperature for the year of Onset DOY winter season (December of previous year-February of onset DOY year). Daylength (s): Number of seconds of daylight for Onset DOY. Accumulated Precip (mm): Accumulated precipitation for the Onset DOY, beginning January 1st. 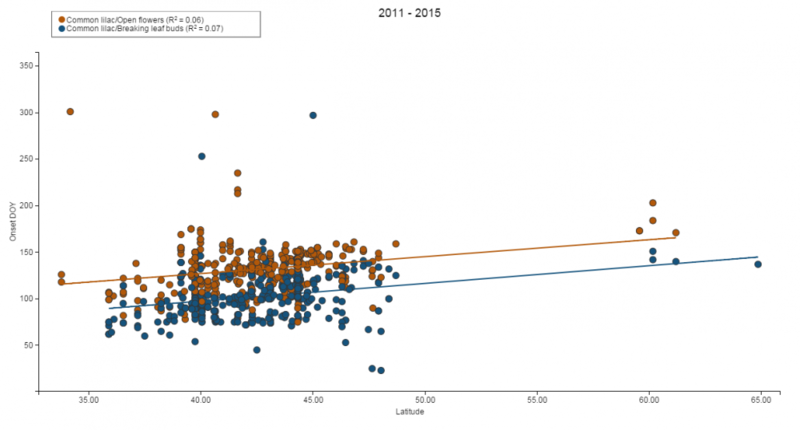 GDD: Growing Degree Days, i.e. accumulated maximum temperature when (Tmax+Tmin)/2 > 0oC for Onset DOY. Cluster Markers: After selecting a filter all sites with applicable data are plotted on the map. Using this setting you can toggle between viewing those sites as clustered groups or having all sites plotted on the map at once. Default is to cluster. Variable Displayed: Allows you to define which variables are counted and displayed on the maps. This affects both the site clusters as well as the filter tags. You can choose between displaying the number of phenophase status records or the number of sites. Species Tag Title: Allows you to toggle between common names or scientific names throughout the visualization tool. Exclude less precise data from visualizations: This setting affects which observation data are used in scatter plot visualizations. For selected species/phenophase combinations, each individual within a defined geographic area is plotted for each selected calendar year. Onset date is calculated as the first date of the calendar year where the presence of the phenophase had been reported (ie. the first “yes” record). Configuring this setting to "yes" excludes individual onset dates which do not have a "no" record preceding the "yes" within the calendar year for display on the scatterplot. If there is a "no" record preceding this first "yes", then the number of days between those records can be used to determine uncertainty in the true onset date.